A first recovery occurred after the street from Templin to Fürstenberg and was built and the connection to the railway was established in 1899. From the 17th century up to the middle of the 20th century Lychen remained a traid hub in timber industry. Major parts of Berlin and the important harbor in Hamburg were built from wood from Lychen. 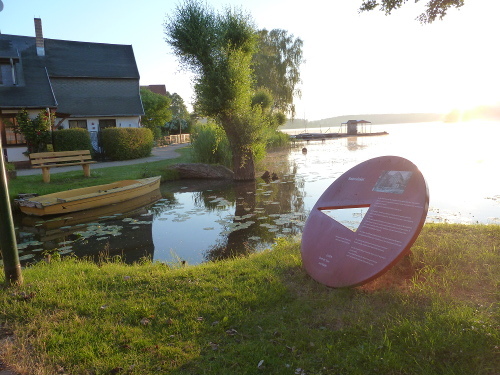 Wood was brought from the large forests to the lake Oberpfuhl and was rafted to the town lake which is connected to river Havel; In 2008 Lychen was named “Flößerstadt” (engl. rafting city). International reputation was attained in 1902 when the clock maker Johann Kirsten invented the thumbtack. With reference to that all the tourist information around sights in Lychen is written one large Tacks. Regrettably the sanatoriums, which were founded with best intentions, were converted to labor- and sports-sanatorium during the NS-Regime and later even to a SS military hospital. From 1945 until 1993 the clinics were used as a military hospital by the Russian occupation. The beautiful and large villas are being reconstructed little by little and converted into flats and holiday apartments for a couple of years now.